Printing on glass requires additional levels of expertise - in how glass is designed, manufactured, handled and finished, and the conditions in which it will be viewed and used. Glass is produced in many different sizes, shapes, textures and thicknesses for decorative and functional use in buildings, home décor, automotive windshields and windows, bottles, jars, tubes, and touchscreens on appliances, computers, tablets, and smartphones. All glass is produced at high temperatures in glass furnaces and cooled at even temperatures in annealing ovens. But different chemistries, firing temperatures, and heating and cooling cycles produce different types of glass for various requirements. The float glass process produces sheet glass, and glassblowing produces hollow glass such as tubes and containers. Although some UV-curable inks are fine for some décor and bottling applications, specifically those that require primers and topcoats to fix the inks to the surface of the glass, they don't work well for flat-glass applications such as architectural or automotive glass. These applications require specialized inks that can withstand the higher temperatures associated with strengthening and laminating for greater durability. So, direct printing on glass is primarily an industrial process. In Part 1, we'll highlight some industrial inkjet printing systems for flat glass. In Part 2 we'll look at industrial inkjet printing systems for decorating glass bottles and packaging. Flat glass is often custom-processed to meet specifications for safety, durability, structural strength, energy efficiency, and soundproofing. This requires specialized inks and design techniques. Plus, the glass must be thoroughly cleaned and handled with care during all phases of processing. Dip-Tech has been selling digital ceramic-ink in-glass decorating systems since 2006. Dip-Tech manufactures digital ceramic printers for external and internal architectural and transportation glass. According to Dip-Tech's Director of Marketing Shimrit Marom, "The early adopters were glass processors who were already specializing in glass printing and glass decoration with technologies such as a screen printing, UV-ink printing, or sandblasting. They quickly recognized that digital ceramic in-glass printing could provide a more efficient and innovative option for producing decorative glass." Each Dip-Tech system combines high-precision printing systems, long-lasting ceramic inks, and proprietary image processing software. Dip-Tech digital ceramic inks include sub-micron glass fit and natural pigments that fuse with the glass during the high-heat glass tempering process. The inks were developed to ensure lasting vibrancy and photorealistic color as well as functional performance such as light diffusion, glare reduction, and slip-resistance. Dip-Tech inks are highly resistant to scratching, UV light, and weather. DXP image processing software converts standard graphic files into ready-to-print files optimized for glass. The software includes a Pattern Generator plug-in for Adobe Illustrator, automatic color separation optimized for transparent media, and a color atlas for converting RAL and Pantone colors. The CMIX ceramic pre-mix color guide defines a color standard for the digital ceramic glass printing industry and allows glass processors to and architects to implement precise and consistent color matching. The Automatic Tiling feature scales up and tiles images to create large, multi-panel facades and also numbers each panel to ensure correct placement during installation. Industrial producers of flat glass use digital printers with ceramic inks, in which inorganic pigments and glass frit are fused directly with the glass at temperatures that would cause organic additives and ink binders to decompose. After bubbles and voids are expelled to give the glass a compact, shatter-resistant structure, the surface is treated to give the flat glass the characteristics the client has specified. A successful firing of the glass and ceramic ink produces a bubble-free layer in which the pigments are properly distributed in a panel that is uniformly thick. Some ceramic inks add functional properties that multi-substrate UV-curable inks can't deliver. Some digitally printed ceramic inks can make glass floors and staircases more slip-resistant or entire buildings more energy efficient. Printing images on glass also involves extra design considerations. For example, if the glass will serve as a room divider, the design on the back of the glass should look just as beautiful as the design on the front of the glass. Factors such as the thickness of the glass, greenish or bluish color variations from batch to batch, surface coatings on the glass, and how the glass will be lit can all affect how the design will look after the decorated glass is permanently installed. Planning well in advance and testing the design outcome is an integral part of the design process, because once the glass is installed, it is costly to make changes. Currently, companies such as Dip-Tech, Durst (SGIA member since 2002) and Tecglass sell inkjet printers for decorating flat glass used in building projects and automotive manufacturing. This Spain-based company was formed in 2002 by a group of professionals with more than 100 collective experience of the glassy industry. Over the past five years, Tecglass has researched, designed and developed the Vitro-Jet range of inkjet printers specifically for direct printing of photographic images and graphic designs directly onto flat glass. The Vitro-Jet printers can be configured to use either UV or ceramic inks to print on flat glass for either interior or exterior applications. Printer models include the standalone, entry-level Vitro-Jet ST model, Vitro-Jet MA/MO/MT mid-range models for growing businesses, the Vitro-Jet XY solution for small spaces, and the Vitro-Jet XXL superwide printer for "Mega Jumbo" sizes. Complementary equipment includes the Vitro-Wash machine for perfect pre-print glass cleaning, the Vitro-Clima clean-room, the Vitro-HIT dryer for digital ceramic inks, Vitro-M's tilting and transport tables for the digital-printing line, and the Vitro-Roll roller coating machine for finishing. Glass processors specialize in producing different types of glass products to meet the specifications of architects, designers, developers, engineers and consultants. Like printing companies, glass processors continually seek fresh ways to add value to their products. Industrial inkjet printing systems for glass decorating enable glass processors to offer customers personalization and customization capabilities that aren't as economical with screen printing or other forms of glass decorating. According to IBIS World analysts, glass manufacturing in the US is a $26 billion-per-year business that employs 86,496 people in 4,652 companies. The IBIS report grouped glass manufacturers and processors in four categories: (1) flat glass; (2) glass containers; (3) pressed or blown glass; and (4) glass purchased for other products (such as mirrors, light fixtures, arcade games, furniture, or touchscreens). 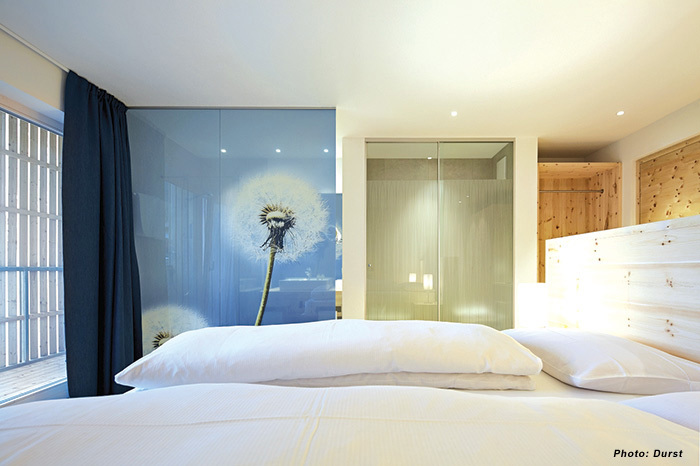 Flat glass is manufactured in different thicknesses and with different properties to perform certain functions. For example, flat glass can be laminated, tempered, heat-treated or chemically toughened depending on whether the glass must withstand hurricanes, hailstorms, chemical spills, explosions, car crashes and burglaries. Laminated glass is produced when two or more units of flat glass are permanently bonded together with an inner layer of a strong, clear resin (polyvinyl butryral or ethylene vinyl acetate). The inner layer holds the glass together, even when the glass is shattered. Laminated glass can also be manufactured to improve the sound-insulating properties of office partitions or block UV rays in windows. Tempered glass undergoes an additional heating and cooling processes that gives it about four times more strength than the basic annealed glass used in home windowpanes. Whereas annealed glass breaks into sharp, irregular shards, tempered glass breaks into many small, safer pieces that aren't jagged. Architects and interior designers use laminated and tempered flat glass for indoor fixtures such as partitions, doors, curtain walls, backsplashes, shower stalls, floors, staircases, elevators, and decorative art, or exterior elements such as windows, facades, skylights, canopies and balconies. Creating designs for long-lasting, direct printing on a transparent, non-porous substrate such as glass is far different than designing signage or displays that will change within a few years. 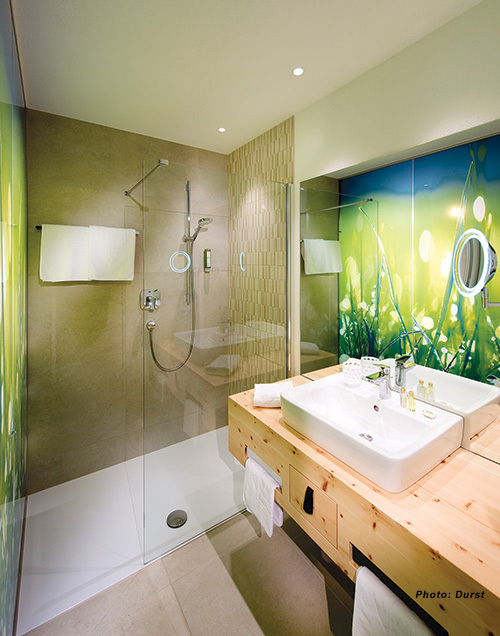 On glass, the designs can be both decorative and functional. According to experts at Dip-Tech, digital ceramic in-glass printing allows for the creation of colorful, durable, and functional designs that were previously impossible. 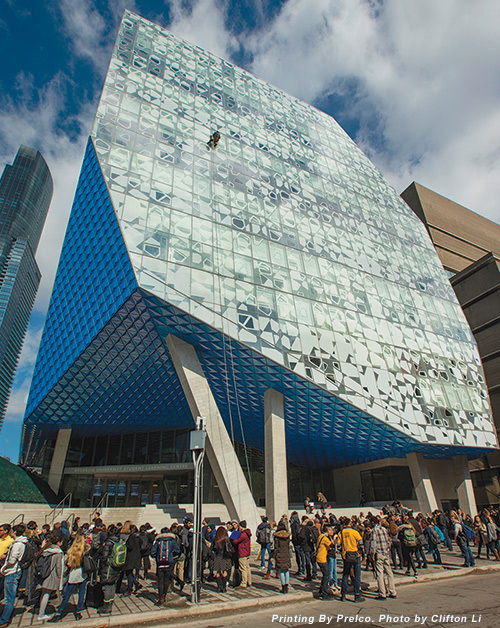 Some glass design techniques can affect durability, which is critical when designing buildings that will last 30 to 40 years. Other designs address issues of sustainability which are essential requirements in new construction. "Digital ceramic printing is changing the way architects think and plan," explains Niv Raz, head of Dip-Tech's Architecture Division. "Digital ceramic printing not only affects small details, but can the design can impact the whole project." 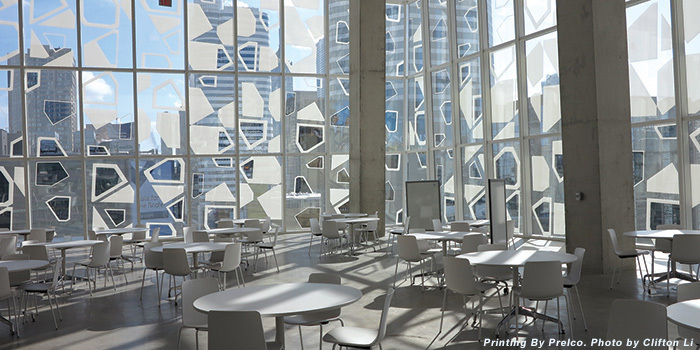 For example, by changing the density of patterns printed into the glass, architects can control how much natural light enters a specific room and how much solar heat gain typically occurs during the daylight hours in a site-specific location. 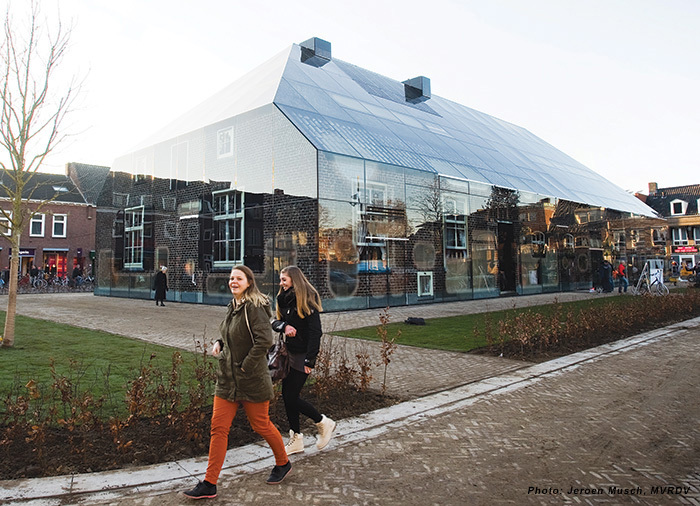 The ability to make glass more functional is becoming increasingly important as architects are expected to design energy-efficient buildings that will meet LEED certifications. 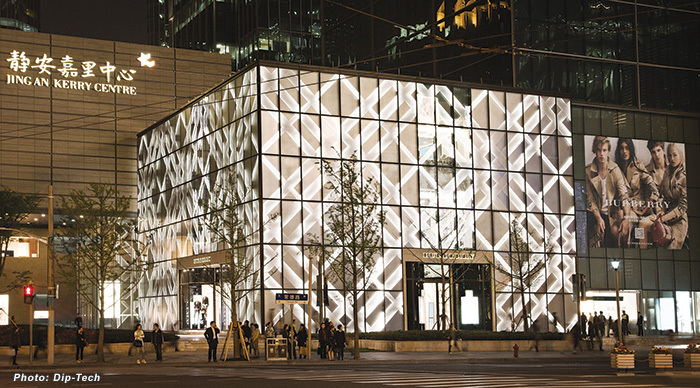 With Dip-Tech's printed glass performance calculator, architects can evaluate the energy performance of glass printed with Dip-Tech's digital ceramic inks. The calculator enables glass designers to measure the impact various designs will have on the Solar Heat Gain Coefficient and the percentage of visible light of the glass. Designs can also be used to solve other challenges such as preventing birds from crashing into clear windows or to emulate the look of more costly, less environmentally friendly building materials. The see-through properties of glass create both technical challenges and creative opportunities. With direct digital print systems and the right software, designers can create unique effects with double-vision printing, where different graphics are printed on top of one another for viewing designs from different sides of the glass. Multi-layer printing makes it possible to print a sharply focused graphic over a more translucent, soft-focus background that looks opaque from the other side. The creative options are limitless. Glass design is emerging as a specialty niche for designers and artists who have been trained in what's possible with glass printing technology. Sometimes, the architect may hire a digital glass designer or digital glass engineer to create the design for the glass. In some cases, the glass processor will offer glass design and file preparation as a service to their clients. The Durst Industrial Inkjet Application subsidiary in Lienz, Austria has developed the new Durst Rho Vetrocer series of flatbeds specifically for industrial glass decorating. The Rho Vetrocer uses an inorganic ceramic ink print system formulated for glass printing. The ceramic ink is applied directly to the glass without a primer and permanently fused to the glass during a post-print baking stage in an inline infrared dryer. Flat glass decorated with the Rho Vetrocer can be used for interior shop furnishings, bar decorations, gaming machines, touch screens, shower stalls, elevator cover panels and doors. Outdoor applications include building facades, temporary stores, seasonal outdoor signs, temporary exhibitions and solar panels. 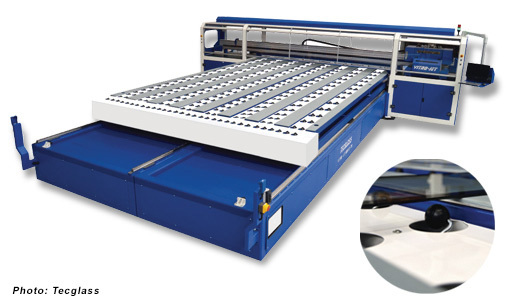 The Durst Rho Vetrocer 250 can decorate glass up to 2.5 meters wide and up to 8 meters (26 feet) long depending on the weight of the glass and the supply table. The dryer performs the delicate process of curing ceramic inks at a temperature of 110*C. The process is automatically adjusted by the surface sensors which measure the surface temperatures of the glass as it enters and exits the dryer. The glass can be baked to produce laminated safety glass. The ink for the Durst Rho Vetrocer is a mixture of metallic, non-toxic pigments, lead-free glass frits, and dispersing and carrier fluids. Printers come with red, blue, green, yellow, black and white inks. Satinato (glazed) inks or specific RAL or NCS-tone inks are available as options. The inks are free of lead, cadmium, and nickel and comply with DIN regulations. Color management software developed by Durst enables designers to reproduce RAL standard colors on glass. Capabilities such as automatic tiling, scaling, queuing, and mirroring are provided through Caldera RIP software. 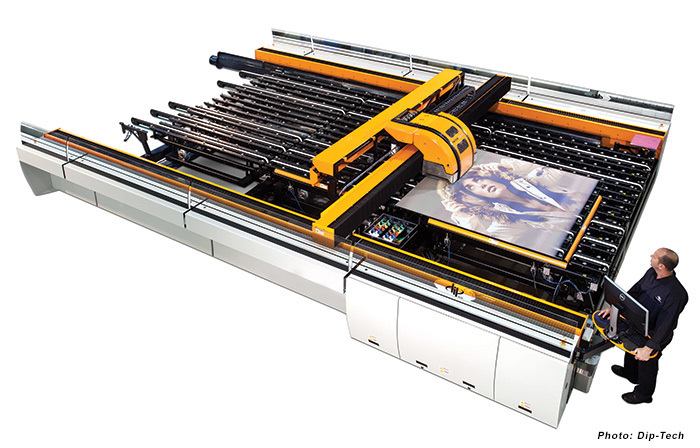 The Vetrocer's media transport system has suction cups on the deck so the glass can be registered with extreme precision for the print and curing process and then returned to the starting position for double-vision graphics or multi-layer print processes. Surface sensors allow round-shaped glass or glasses with rounded edges to be precisely positioned for printing. For signs, graphics, and displays on glass, it may be easiest to print and apply clear films, decals, and labels. These solutions work well for smaller areas glass and for applications that don't have to last more than five or ten years. But industrial inkjet systems with specialized ceramic inks are a must for higher-end, large-scale glass-decorating projects that must last for decades under a variety of harsh conditions. Glass processing is likely to become even more complex as glass becomes more popular for touchscreen panels on computing devices and home appliances. "Intelligent glass" with composite nanocrystal coatings that can selectively block out heat and light is expected to be a popular choice for designing energy-efficient buildings. Architects are just beginning to experiment with what's possible. In a five-story building in Hamburg, algae grow between the glass panels of the "bio-reactor" glass façade and produces bio mass and heat from the combination of light and carbon dioxide. Heat exchangers feed the heat directly to the 15 apartments in the building and the bio mass is skimmed off and uses to produce bio gas. A fuel cell converts the bio gas into electricity and heat. As glass becomes more popular as a building material, glass processors with experience with screen printing and other forms of glass decorating may ultimately have an advantage in using direct digital glass printing systems. These companies are already familiar with the variety of ceramic, screen printing, and conductive inks that can make glass more beautiful and more functional. Stay tuned for Part 2 of this series, where we'll discuss the challenges and technologies for direct printing on glass bottles - and a few of the companies that have already breached the market. Eileen Fritsch is a Cincinnati-based freelance writer. Contact her at eileen@eileenfritsch.com. This article appeared in the SGIA Journal, November / December 2015 Issue and is reprinted with permission. Copyright 2016 Specialty Graphic Imaging Association (www.sgia.org). All Rights Reserved.